I have been interested in trying Philippine cuisine for a few months, lucky for me one of the few authentic Philippine eateries in the state is located in Tulsa, Oklahoma. Philippine food is heavily influenced by Chinese, Spanish and American cuisines. This unique fusion of spices, techniques and flavors from around the globe has given Philippine cuisine an amazing personality all its own. The small shop and restaurant combination is homey and welcoming without being crowded or stuffy. We were immediately greeted by the owner who was nothing less than delightful. She loved to talk about her food and was quick to point out the differences between the Philippine style dishes and their like named counterparts from Spain and China. I found her conversation informative and charming as you could see the excitement on her face as she spoke. She suggested that we try the lumpia, there were two different kinds so I ordered both. The lumpia is a Philippine version of the Chinese egg roll. She explained that all of the lumpias at Phil-Asia Eatery are made fresh daily; using her specially seasoned meats and fresh vegetables, they are rolled in rice paper and then deep fried. They offer two styles of lumpia with several combinations each. The Shanghai Lumpia consists of 12 bite size deep fried wraps of seasoned ground meat served with an awesome slightly sweet and spicy chile sauce (available for purchase). We had our choice of beef or pork; I chose pork and loved every bite! The Vegetable Lumpias are larger than the Shanghais and are more comparable in size to the traditional Chinese eggroll. They come three to an order and arrived at our table fresh from the fryer and piping hot, but not greasy. With the Vegetable Lumpia you have the choice of pork, chicken or vegetable only; since I had the pork Shanghai, I chose chicken. I enjoyed them with the chile sauce (I love that stuff) and she later brought out a little bowl of vinegar, she said that the vinegar enhances the freshness of the vegetables and she was right. Beneath the golden brown crust were beans, carrots, yam and bean sprouts with tiny pieces of chicken. I barely noticed the meat in these wraps as the fresh crispy vegetables were clearly the star of this tasty appetizer. For my entrée I chose Beef Caldereta. Normally, I am a more adventurous eater, but she suggested the dish and I happily agreed. The Beef Caldera at Phil-Asia Eatery was exceptionally tender chunks of beef with onions, garlic, potatoes, and carrots in a thick and savory beef sauce; it arrived at my table in a bowl and served with a plate of rice. The deep savory aroma rose from the bowl which immediately brought to mind Mom’s pot roast. I poured the thick chunky bowl of beef and veggies over my rice and began to eat. The flavors were completely familiar and comforting. It tasted as if came straight from Momma’s kitchen, not at all what I expected to be eating at a Philippine restaurant. Tom chose the Philippine style Menudo which unlike its Mexican cousin is 100% Tripe-free. This dish was very mild and, after tasting my Beef Caldereta, I found it to be a little bland mixed with the rice, but still nice. Philippine Menudo is sautéed pork, potatoes and carrots in a tomato based menudo sauce. I noticed Tom finishing off the last couple of bites with a little chile sauce, he clearly enjoyed it! This is the point of our meal where I get scolded for ordering appetizers. It is all smiles in the beginning, but once Tom realizes that he does not have room for dessert, then I am the bad guy! The dessert menu has several choices with exotic sounding names like Halo-Halo, Biko, Cassava Cake and ice cream choices of ube (purple yam), mango and macapuno. Although we did not have room for any of these sweet treats, I purchased a container of ube (purple yam) ice cream to enjoy at home. It is electric-purple in color with a smooth creamy texture and a slight hint of hazelnut; although it sounds a little odd, it is quite yummy (even my finicky teenager likes it)! The house specialty at Phil-Asia is Crispy Pata, a specially seasoned pork leg deep fried for a super crispy outer crust. It takes about 20 minutes to cook (a perfect time to try the Shanghai Lumpia) and it feeds about 3 people. I have not yet tried the Crispy Pata, but I am looking forward to it. In fact, their menu is refreshingly small and the prices are so reasonable that I am looking forward to trying everything on their menu! Another great thing about this place is that it offers a small exotic food market. I was able to finish my meal and walk over to the market and browse shelves and freezers of unique food items. I brought home a large bottle of the Chile Sauce, some noodles, a commercial package of Shanghai Lumpias and a container of ice cream. I then paid for everything at once. Now, I can enjoy unique and yummy snacks at home. She even gave me some tips on how to cook my lumpias. Phil-Asia Eatery is the perfect place for me! The menu is small, so the dishes are all competently prepared, the atmosphere is open and welcoming. Most entrees are priced around $4 and you can browse the Asian / Spanish food market to pick up your favorite condiments and snacks after your meal. It is also nice to know that I can try something adventurous while my husband can order something comforting and familiar. This is my new favorite Tulsa restaurant and I look forward to going back often. When shopping for a cabin rental I always look for: amenities or luxuries that I do not have at home, a location that is close or on the water, enough beds for the family, and a rental price around $200 - $250 per night. Rarely do I get everything I am looking for, but this time I was pretty confident I had made a great decision. 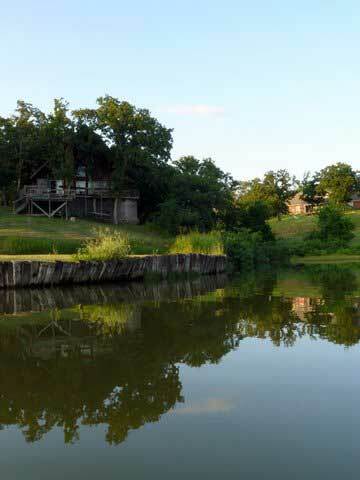 Since we would be visiting the Davis area I chose Moonlight Bay Chalet located half way between Sulphur and Davis, Oklahoma... very close to Lake Arbuckle. The Moonlight Bay Chalet is managed by Premier Lake Properties and has several homes/cabins in the area. The cabin hit all my targets, located on a large pond Tom and I could paddle safely at night, under $250, hot tub on the decks with a great view, conveniently located to major attractions and down the road from Guy Sandy access on Lake Arbuckle. It sounds great and it was not too bad, but there were some major problems with the cabin that simply cannot be overlooked. The front of the cabin that faces the large pond is glass, this offers a nice view, but makes it impossible to keep cool. We were never comfortable during our stay, always a little too warm. It probably would not be an issue during the winter months, but I cannot recommend staying there in the summer. We also found several notes warning us of additional charges and asking us to perform mandatory housework (including laundering towels) before leaving promptly at 11am. The wording in these notes was a little insulting and reflected poorly on management. All the little things were done wrong too, the toilet paper was poor quality, there was no soap available in the downstairs bathroom and the track doors were a nightmare to close. The spa had been abused, it was missing jets, the air control did not function and it would only heat up to a pitiful 104F. It was clean, but much more enjoyable cold than it’s max setting of tepid. The decks and dock were neglected and have not been properly weatherized. It suited our needs, but it was a little unnerving to feel the deck bow underneath your feet, I started to wonder how safe the hot tub is up there. The dock ladder was nailed on a loose board and although I used it, I would advise being cautious. It would have also been nice if management would trim the weeds around the waters edge. If you are looking for a luxury cabin where you can truly relax I would not recommend staying here. If you are looking for a quiet fall hideaway with no frills, but close to popular attractions this may be something to consider. Tom and I spotted this cute little Downtown café in Baxter Springs Kansas called Café on the Route. We arrived straight off the river complete with sandals, dirty baseball cap and all. This is not normally a problem, but when I saw the waiter in dress blacks, I felt a little underdressed. Upon entering I knew I was about to be surprised by this little café, I walked in expecting “The Great American Greasy Spoon”, but this was obviously something entirely different. Our waiter was very friendly and upbeat, he let us know of the special for the evening which included crab legs and shrimp scampi. The specials sounded scrumptious, but the menu was what blew my mind! Below are just a few of the entrees that caught my attention. Aztec Chicken – 8oz sautéed chicken breast with shrimp, bacon, avocados and chilies. Slattery Chicken – 8oz chicken breast stuffed with Swiss Cheese and corned beef served with cream sauce. 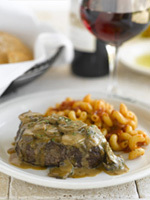 Flap Jack Ribeye – 8oz steak stuffed with onions, mushrooms, and provolone cheese, served with concasse sauce. They also had neat sounding sides: Skinny fries, fried potato salad, parmesan potatoes & tobacco onions just to name a few. I was going to order the Aztec chicken, but I let Tom talk me into the Spicy Avocado Pepperoni Strip which is basically an 8oz strip served with sliced avocados and a spicy pepperoni glaze, it was served with mixed veggies and my choice of potato. Tom had the Flap Jack Ribeye, my samples were nice, very flavorful and reasonably tender. The cheese, mushrooms, and meat went together wonderfully and although a little splashy, the sauce gave the steak an added savory flavor. Although I was very impressed with the service and the adorable downtown building, the meal put in front of me was not as impressive. The steak had quite a bit of gristle and was far from pleasantly tender. The avocado was interesting, but the pepperoni glaze just did not “do it” for me. If the steak would have been tender I could have enjoyed the meal, but instead I left disappointed and honestly a little sad…but not for long! I turns out, the next day was their spectacular Sunday brunch and after a morning on the river (in the rain) we were not going to miss out on that. The small café we dined in the night before had been opened up to include a banquet room with tables of freshly stocked hot items. The amount of food on this buffet will rival any Sirloin Stockade, but with a larger variety than the one in my small town. They offered fried chicken, potatoes (fried & mashed), catfish that was very lightly breaded, extremely tender BBQ brisket, salad fixings, and an assortment of vegetables. After the meal you are given a choice of two freshly made desserts, after eating mine and sampling Tom’s I can confirm that they were both equally heavenly. I seriously believe that I caught the chef on a bad night and I look forward to giving it another try. Next time, I will order the Aztec chicken and the skinny fries and encourage Tom to get the fried potato salad…I cannot wait! Café on the Route is located in Baxter Springs KS at 1101 Military Ave. KS. Carrabba’s has an Italian Sangria that I was eager to try; it is a classic sangria made with Korbel, fresh fruits and their house wine, either Pinot Grigio (white) or Montepulciano (red). I mentioned that I had never had a white sangria before and the next thing I knew our waiter Donny had small sample of both on my table, at that point I knew Carrabba’s was something special! Ultimately, I chose the red sangria and it was wonderful, cinnamon flavors with citrus fruits and spices were very flavorful yet not overwhelming. The white sangria was nice, but with the complex spicy flavors and personality of the red, it was love at first sip. For the appetizer I chose the Cozze In Bianco which was not at all what I expected. They raise their mussels on ropes so they are very meaty and free of grit as they have never touched the ground. 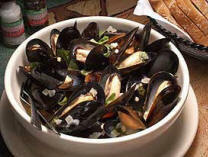 The mussels are steamed in white wine, basil, lemon butter and Pernod (a liqueur) and served in a large bowl for all to share. They were incredibly fresh, light and buttery, we both enjoyed the warm fresh bread dipped into the yummy mixture. Tom who is normally turned off by food that in any way resembles its living form loved the dish and even asked if he could have the last one! Deciding on the entrée was the hard part, there are so many dishes that sound amazing and because the exhibition kitchen was directly in front of me I got to see and smell all of these wonderful things being made. I chose the Damian named after one of the founders Damian Mandola. The Damian is a variety of seafood favorites, lobster ravioli, Spiedino di Mare (grilled shrimp and scallops over pecan wood) and grilled salmon served with Italian green beans. The first thing I noticed was the unmistakable sweet smoky scent of the shrimp and scallops so I had to try them first, they were so fresh and smoky I loved every bite. The lobster ravioli was nice, the portions were a reasonable medallion size making it a perfect consistency throughout; I find large raviolis are often mushy. On top of the grilled salmon was a nice sauce with pickled artichoke slices, it was a lovely contrast to the fish. The salmon was perfectly portioned and grilled with skill, crispy, slightly crunchy outside and moist on the inside it was an example of perfection. Thomas chose a Caesar salad with his Steak Marsala and smooth, garlic mashed potato. The Caesar salad was lightly vinegary, wonderfully crispy, cheesy and peppery it was really a nice simple salad. Carrabba’s is known for their marsala sauce, you can get it with pork and chicken, but Tom chose steak because he wanted something a little more challenging. Too often steaks are cooked wrong or tough, but his steak was cooked to a true medium and was tender and juicy. It was topped with mushrooms and Marsala Sauce that gave the steak a savory mushroom flavor throughout, I think that next time I’m going to order that dish for myself. The service at Carrabba’s was excellent; our waiter Donny was friendly, knowledgeable and extremely good at what he does. The staff is not only genuinely good natured towards clients, but you can see how helpful and considerate they are to each other. It definitely exceeded my expatiations and has raised the bar on what the Tulsa area to have to offer.